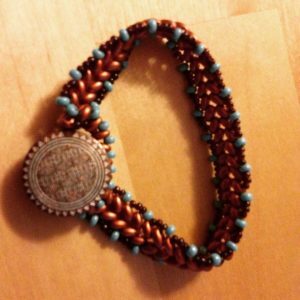 This custom made copper colored beaded bracelet has a herringbone pattern & is created with super duo beads with copper colored beads on the inside. The button loop clasp has a unique button. Just measure around your wrist and order the needed size. 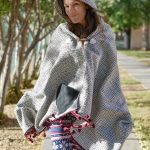 Pair with any outfit for any occasion and feel one with the Southwest. This custom made copper beaded bracelet has a herringbone pattern & is created with super duo beads with copper colored beads in the center. The button loop clasp has a unique button. 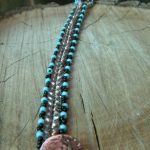 This bracelet is available in 6, 6 1/2, 7, 7 1/2, and 8 inch lengths. Just measure around your wrist and order the needed size. Pair with any outfit for any occasion and feel one with the Southwest. 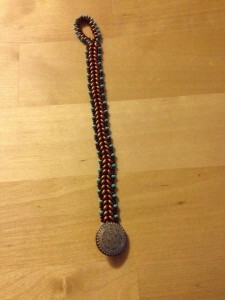 Copper Colored Beaded Bracelet features a unique button! Copper Colored Beaded Bracelet is perfect for any occasion!